My first-hand experience with public service delivery in Moscow started when I headed to my first round of job talks at Vyshka (the regional dialect for HSE) in early 2014. I took a citizens perspective. I recognized that a large truck with a high pressure spray nozzle was approaching from behind. 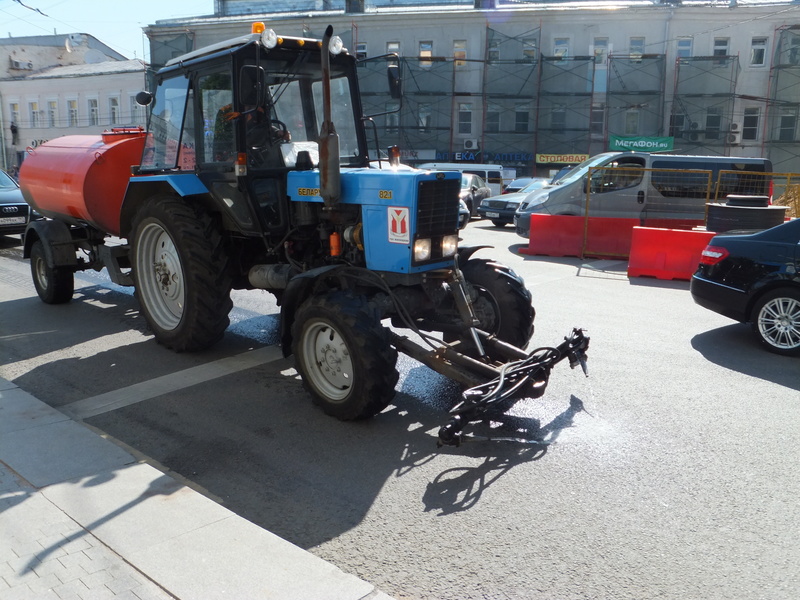 It turned out later on that this is a common scheme to clean the streets from dust in the summer and from mud in springtime. The sideeffect – which I anticipated much quicker – however, is that a significant chunk of this melange of dust and dirt splashes onto the sidewalk. It is clear to the reader what followed. At least I was able to prevent the worst, good, because I only had one suit with me in Moscow. I was not the only one suffering, other locals shared my situation; a fact that put my mind at ease, because it was not the foolish mistake of an excited foreign who does not watch his steps. Since then I keep respectful distance from what I call the nozzle machines. It is a common scheme in Moscow. In early May they first spray a first truck sprays special shampoo, a second trucks spray water. This is called general cleaning. In more narrow street, e.g. in backyards and sidestreets, the job is done by small scale tractors. I a 70ies book from Richard Scarry on “Cars and Trucks and things that go” (or so), one of my sons favorites books, I recognized a similar nozzle machine. It is called the street washer (not pictured, due to potential copyrights violations). So it seems to be not a Russian thing. The job talks were succesful, by the way.